Johnsons has refreshed its range with Sarah Raven, to launch a new style for 2019. Still with large packets and featuring beautiful photography, the eye catching new design continues to have a premium feel, creating a modern and attractive display. Four carefully selected new varieties have also been added to the collections for this season. Daucus Purple Kisses (RRP £2.80 for 150 seeds) is an airy and elegant mix, making it a perfect filler foliage plant for almost any vase. Not only that but the bees and butterflies love it. Heliopsis Burning Hearts (RRP £3.05 for 15 seeds), a highly rewarding first year flowering perennial, has striking bi-coloured flowers over rich dark foliage and was a stand-out variety at the Johnsons trials in Kentford, Suffolk. 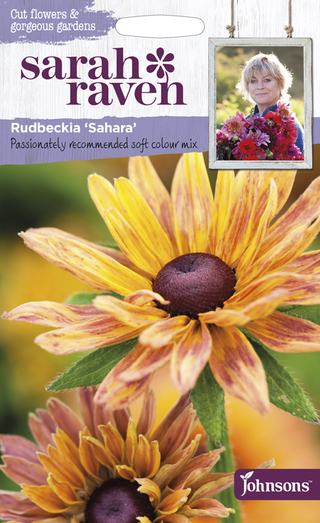 Rudbeckia Sahara (RRP £2.60 for 50 seeds) is a beautiful mix of soft coloured rudbeckias, flowering well into late autumn and one of Sarah’s favourite seed trial discoveries. 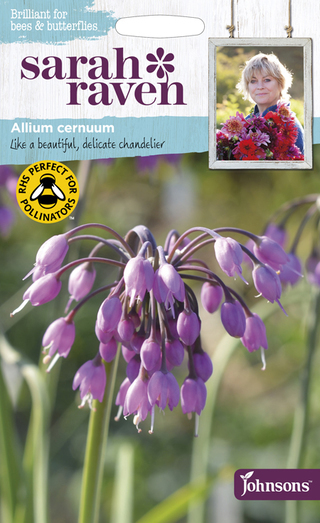 Allium cernuum (RRP £2.80 for 30 seeds), a hardy perennial, is a great wildlife attractor and looks very much like a pretty chandelier. Both collections feature 47 varieties selected by Sarah from flowers she has grown herself in her gardens at Perch Hill Farm and highlight the key trends of flowers for cutting and flowers for wildlife. The new look range is available now from selected garden retailers.